If you’ve been on the roads at all the last few years, chances are you’ve you’re your fair share of vehicle graphics. Oftentimes, these vehicle wraps display some incredibly eye-catching artistic creations. Some of these wraps are done so professionally that they actually look as if they were custom painted. At Apple Graphics, we understand that vehicle wraps are an important component to company success, and we work hard to create the perfect wrap for your vehicle or fleet. Vehicle wraps are both versatile and cost-effective. Wraps are essentially graphics that are printed on a high-tech adhesive film, and then adhered to your vehicle. There are endless options, and you can choose between having your wrap cover one portion of your vehicle, or even the entire surface. At Apple Graphics, we create distinctive, personalized vehicle wraps for your vehicle or your fleet, and we provide excellent customer care. With the quality service provided by skilled technicians at Apple Graphics, you can rest assured that your vehicle or fleet will be transformed into a magnificent mobile billboard. Why connect with your potential clients through outdated advertising media like phone books when you can connect with them through cutting edge advertising like vehicle wraps? Apple Graphics provides vehicle wraps and fleet wraps that stress brand awareness and demand attention. We are the leading authority on vehicle wraps and fleet wraps in the Philadelphia, Bucks County, and New Jersey area. 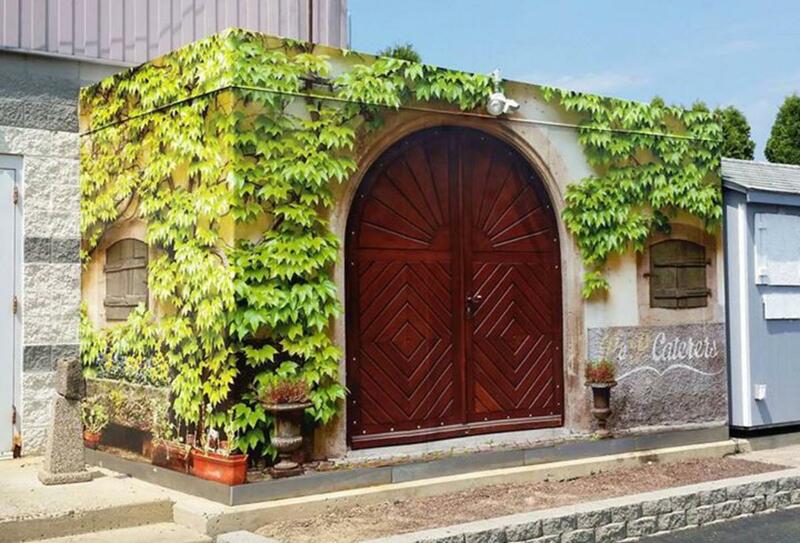 Checking out our projects will give you a sense of our high quality work. Vehicle wraps are the key to business promotion because of their effectiveness and their affordability. The creative graphic designs offer a unique and enticing way to advertise, and they also save your business money in the long run. Fleet wraps are a great way for you to advertise and reach new clients. It’s estimated that vehicle wraps can generate up to 600 visual impressions for every mile. If you want Apple Graphics to turn your vehicle or your fleet into a mobile billboard, then stop by to speak with one of our qualified technicians, and they’ll be sure to get you started. By now, everyone has seen them. Whether you’ve seen one on a busy highway on the way to work, or whether you’ve seen one in the parking lot at your local grocery store, vehicle wraps stand out. Vehicle wraps always turn heads and grab attention. That’s why they’ve grown in such popularity over the years, and why any smart business owner knows that they make for the perfect advertising tool. Besides just looking interesting and unique among the masses of ordinary cars on the road, wrapped vehicles are one of the surest ways to boost your business sales. Vehicle wraps are the latest and greatest in marketing options, and it’s easy to understand why. At Apple Graphics, we understand the effectiveness of vehicle wraps, and our technicians work hard to provide you with the finest options available for your vehicle. If you're looking for a creative method for increasing your brand awareness, then adding graphics to your vehicle or fleet is an excellent decision. Nowadays, people spend less time viewing in-home ads on television. They are also reading fewer ads via mail, too. That being said, it makes sense that consumers are more likely to view ads outside of the home. In that case, why not expose potential clients to your company when they are on the move? With a vehicle wrap, you have the potential to advertise to pedestrians, drivers, and passengers on a daily basis. At Apple Graphics, we can help you choose a creative vehicle wrap that will showcase your company’s greatest assets and bring you the brand awareness you’ve been looking for. 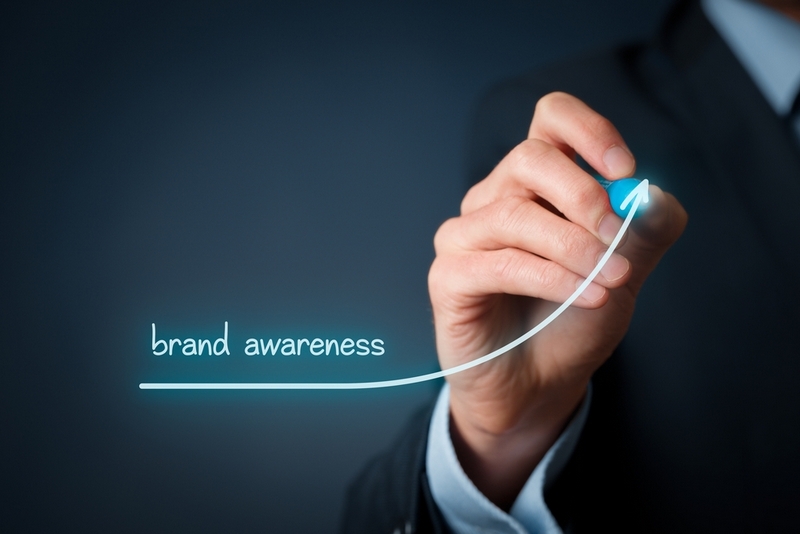 Successful advertising is critical for any small business. Unfortunately, many small businesses have tight budgets and generally don’t have the time or the money for extensive media campaigns. Therefore, smaller businesses usually need to work with a mixed media campaign that includes some version of outdoor advertising. This is where vehicle wraps come into the picture. For one, vehicle wraps are cost effective and if you need to get an entire fleet wrapped, then they offer the biggest bang for your buck. If you need something creative for your brand, there are infinite possibilities for intriguing 3-D, full color graphics. Maybe you’re looking for some kind of creative lettering, or maybe you want a full vehicle wrap. Whatever you decide, Apple Graphics is sure that we can help you come up with a wrap that you’ll be proud of. When it comes to increasing your brand awareness in Charlotte, North Carolina and other surrounding areas, look no further than a vehicle wrap to provide your needs. 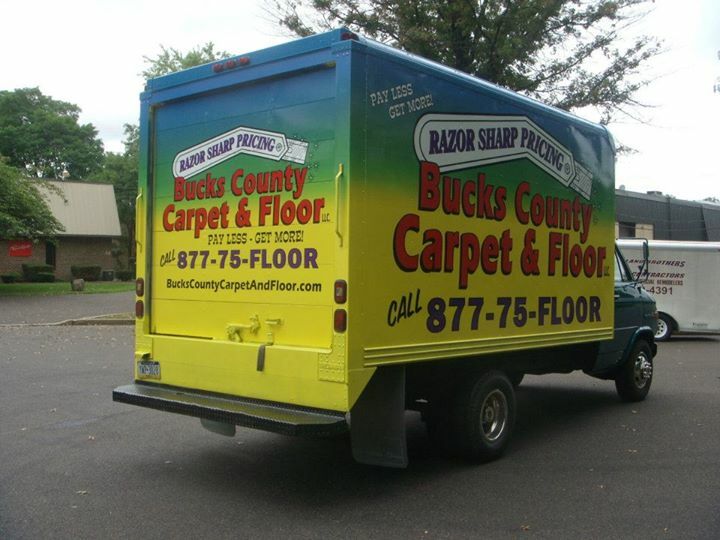 Unlike other dated advertising methods, vehicle graphics are mobile, and they cover more ground than other forms of advertising. Whether your vehicle is parked or mobile, your one-time investment provides repeated exposure to thousands of potential customers. 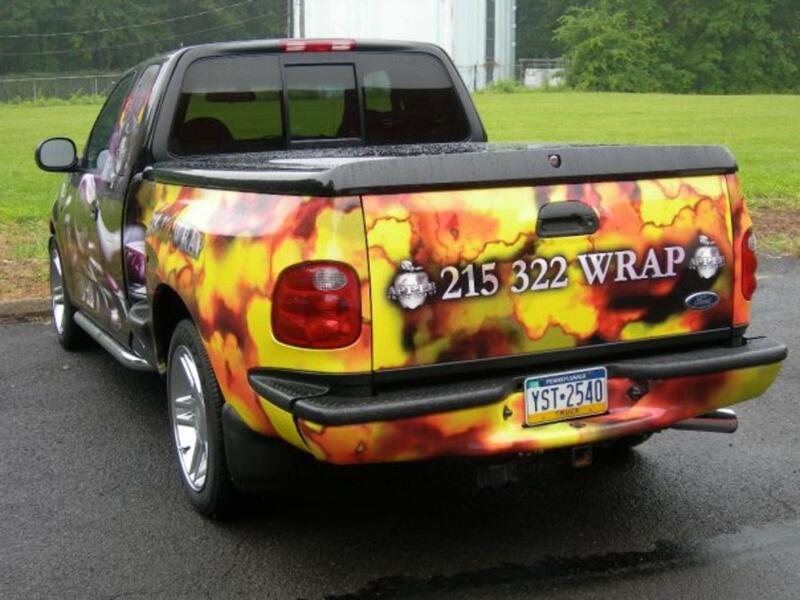 Why are Vehicle Wraps so Popular in Philadelphia and Bucks County? Have you been thinking about getting a vehicle wrap for your vehicle or for your fleet? Vehicle wraps are hands-down one of the best methods for advertising your business. At Apple Graphics, we love working with contractors, freelancers and new entrepreneurs who understand that mobile advertising will increase their company’s visibility. We also know that vehicle wraps are growing in popularity for many reasons. First off, a vehicle wrap is one of the most effective forms of advertising because one single vehicle wrap generates between 30,000 and 60,000 views per day. That’s impressive if you’re trying to boost your sales and reach new clients. Everyone familiar with entrepreneurship understands that the competition is stiff, and that it’s imperative to have your own unique edge. By using simple, traditional advertising, you might get a few new clients, but it will pale in comparison to what you can achieve with a state- of- the- art vehicle wrap from Apple Graphics. Individuality is crucial for thriving in today’s competitive marketplace. If you want your brand to be recognized and if you want to be the first one called when a client requires a product or a service, then you have to be on top of your advertising game. Car wraps offer the lowest cost-per-impression rate compared to any other form of advertising media and are not only affordable for large brands that use vehicle wraps as a core advertising strategy, but also for small and medium-sized businesses, as well. At Apple Graphics, we strive to create the perfect vehicle wrap for your advertising needs. Serving Philadelphia and Bucks County, we boast top of the line designers who create that unique concept for your particular business. We are sensitive to working within your budget means, and we boast certified vehicle wrap installers who are trained by the best in the industry. All of our technicians have completed the Vehicle Wrap Training Course. Your company is now advertised on a mobile billboard. Traffic is now an asset instead of a headache. You no longer need the Yellow Pages. Wraps are the most cost-effective medium for advertising, with up to 600 impressions per mile. The audience for a vehicle wrap is larger. 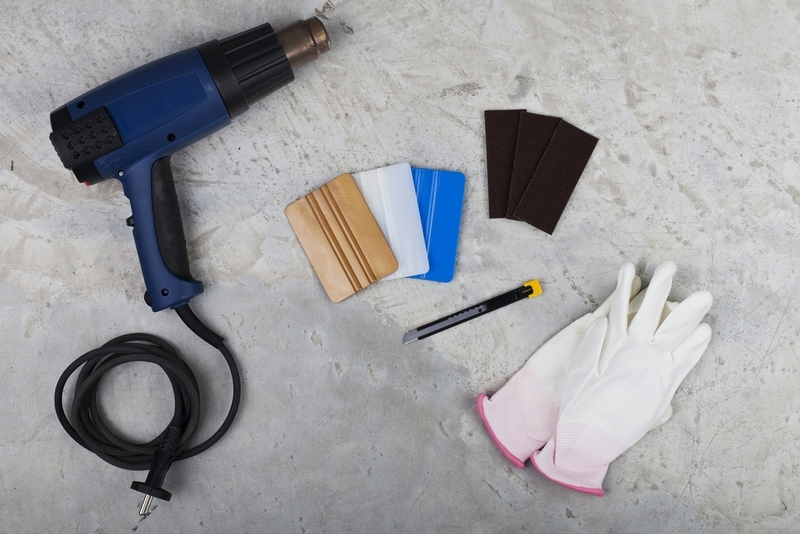 Do you have a business that might be ready for a makeover? Then consider Apple Graphics for your next project. Serving Philadelphia, Bucks County, and New Jersey, we specialize in vehicle wraps, and offer a full line of related services, as well. Corporate logos are imperative for your business, but your brand needs to cover a broad range of creative design. At Apple Graphics, we take your brand to the next level with a more comprehensive approach to visual identity – wall graphics and murals. The front desk and the reception area of your business are important. These areas are usually the first that customers and potential customers observe, and while a friendly smile goes a long way, a more captivating entrance would make the experience more impressionable. At Apple Graphics, we can help you select a creative and unique graphic or wall mural for your business that will leave customers with a positive impression of your business. Why not cultivate confidence in your customers with a visual manifestation of your company mission? 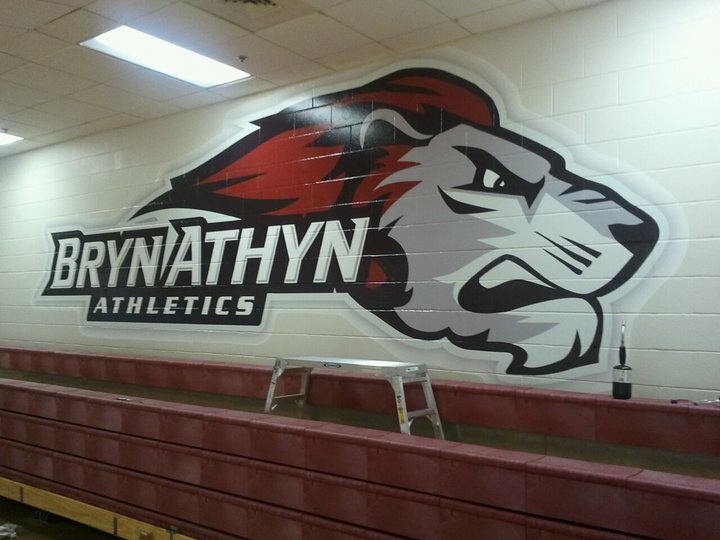 Maybe you’re looking for wall graphics or murals for your school, in your college, or inside a public building. If so, we are ready to help you get started with a creative project that is sure to bring a smile to your face. We work with quality materials to ensure that your completed project has the craftsmanship that you’re looking for. What’s more, our skilled technicians are available to answer any questions that you might have, as well. We specialize in high-resolution, compelling wall graphics for a variety of needs. If you’re looking for a creative way to showcase your newest projects, or if you’re feeling compelled to offer a fresh new look in your lobby, then reach out and ask one of our qualified technicians to assist you. 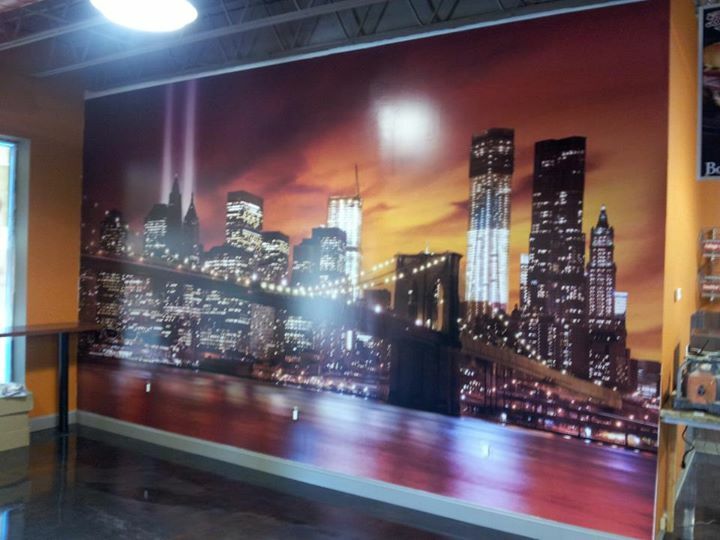 We are proud to offer a wide selection of wall graphics and murals for Philadelphia, Bucks County, and New Jersey. With thousands of wall graphics and murals to choose from, in any custom size you need, we make it easy to find the right look for your space. Simply select an image, choose a size, and we'll get to wok on your creation. Feel like using your own art work or photography? We offer custom wall murals as well as personalization options that are sure to meet your needs, and each one of our projects is held to strict quality standards that are guaranteed to meet your expectations. At Apple Graphics, we pride ourselves on assisting you with all of your project needs. If you need wall graphics or murals for your school, college, or office, then look no further than Apple Graphics to get you started on your next project adventure. Apple Graphics specializes in providing high impact visual solutions in the form of vehicle wraps, signs and banners. We provide you with the ability to maximize your company's exposure and give your company an edge in the advertising world. 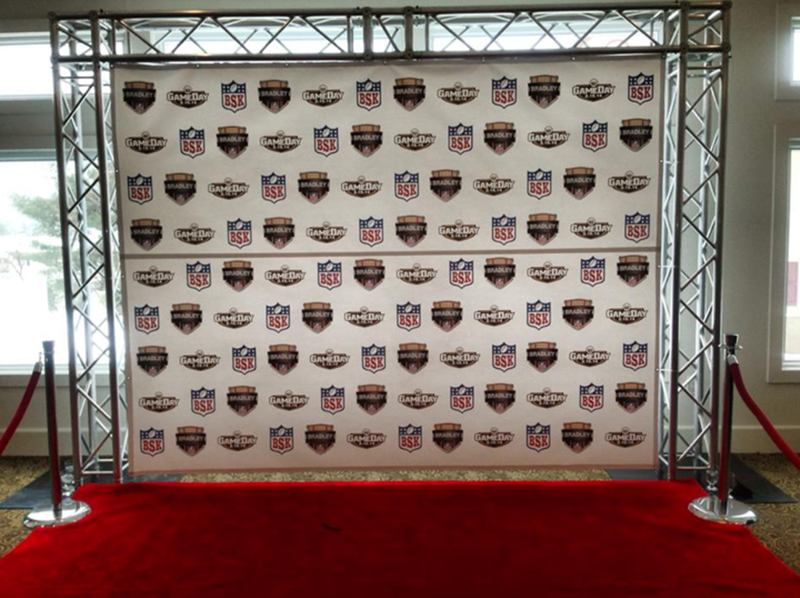 Our services now include a wide range of graphics installations for theme party graphics, red carpet events, corporate events, and custom events, as well. Rest assured that Apple Graphics has all of your graphics needs for the Bucks County and Philadelphia areas. The next time you need to plan a corporate or custom event, why not ask Apple Graphics to assist you with selecting a variety of custom event graphics, pop-up displays, and custom vinyl graphics that will create an eye-catching and professional atmosphere? Do you have an upcoming red carpet or theme party event? Let us handle the graphics that will transform your regular event into a unique and memorable one. Hanging event signs or banners lets your guests know they are at the correct place, and they also provide a professional touch to your event. Corporate and custom event graphics can be designed with the specific colors and logo of your company brand, and we can assist you in making the ideal selection. Apple Graphics is your one-stop graphics shop for dance floor wraps, table wraps, sign-in boards, seating charts, and red carpet backdrops. We also provide a full line of wall art, displays, logo prints, and signs. Whether you need a small 5x7 backdrop to promote your custom event, or a large 10x20 backdrop for a large corporate event, Apple Graphics is your source for backdrops. Our affordable prices, attention to fine detail, and use of high quality materials, will make your backdrop stand out from the crowd. At Apple Graphics we understand how to make every message exceptional. We can work with your brand to make sure that it stands out to current and prospective clients, and provide you with high quality and creative options. Whether you want to feature your corporate logo in a repeat design, color graphic, or even in a compelling background video, Apple Graphics can create a custom background that will make your message unforgettable.